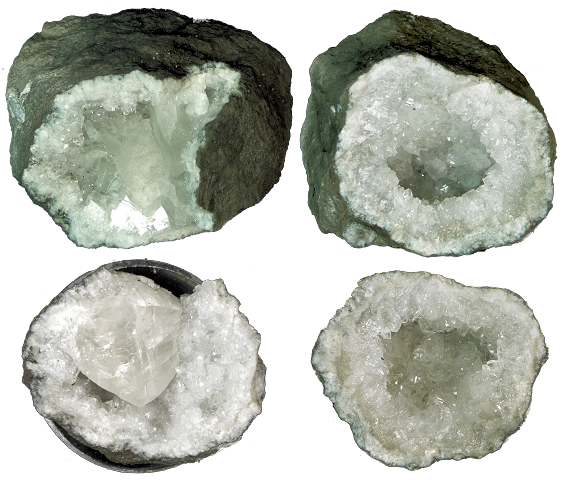 I am selling some of my collection of Keokuk, Iowa quartz crysal geodes. These are cracked open, not cut. Size given is the longest dimension of the crystal cavity. They are completely natural, as they came out of the ground. None of the photos are enhanced in any way - indeed, the photos don't do these proper justice. The Keokuk dig is now buried underneath a freeway exit, so there will be no more coming out. 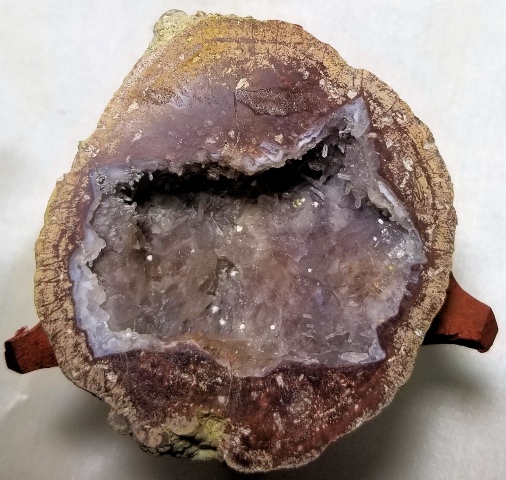 It was unique and no other geodes in the area resemble them. Some of these are from Hamilton, Illinois, a few miles away. Click on the pic or the number to see a larger image image. My camera makes some look a blueish-green color, but they are all a brilliant white. 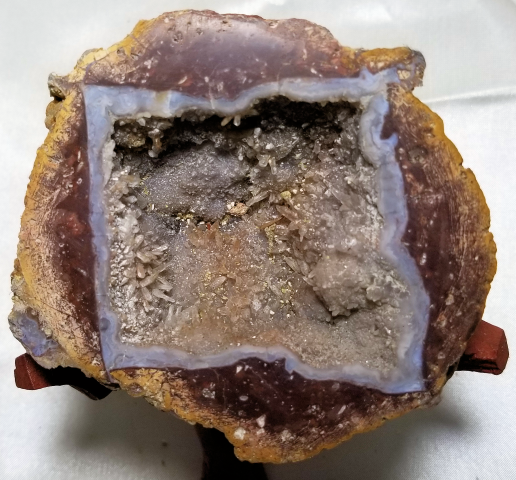 All geodes will be sent Parcel Post mail or flat rate priority mail ($8.00 - $14.00, depending on weight), whichever is less, unless you specify the shipping method. 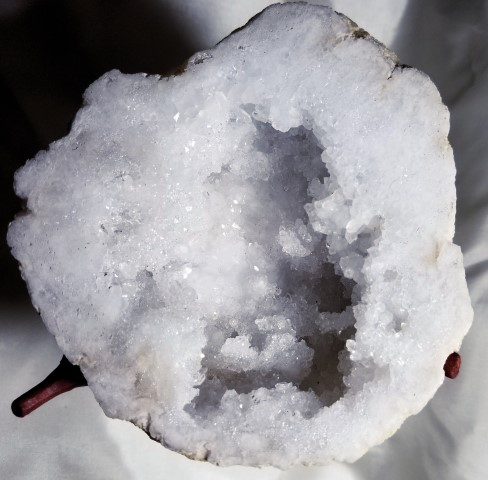 Click on the cart next to the price to purchase a geode via Paypal. If you don't want to use Paypal, email me at the address at the bottom of the page. All of your questions are answered there as well. Click on the pic or the number for a larger view. I wil bill shipping charges later through Paypal. 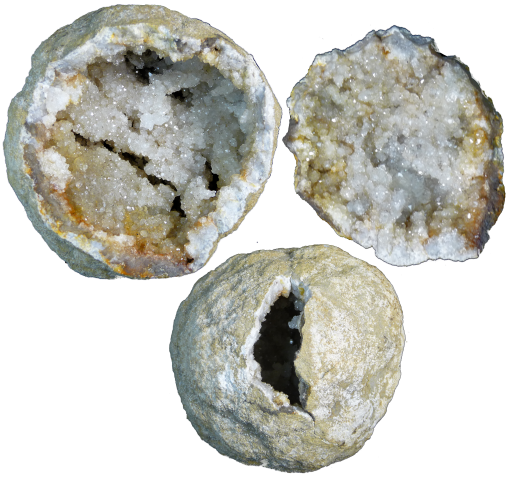 Geodes will be sent via Parcel Post Mail for light or small eggs, or flat rate priority mail ($14) for larger ones. 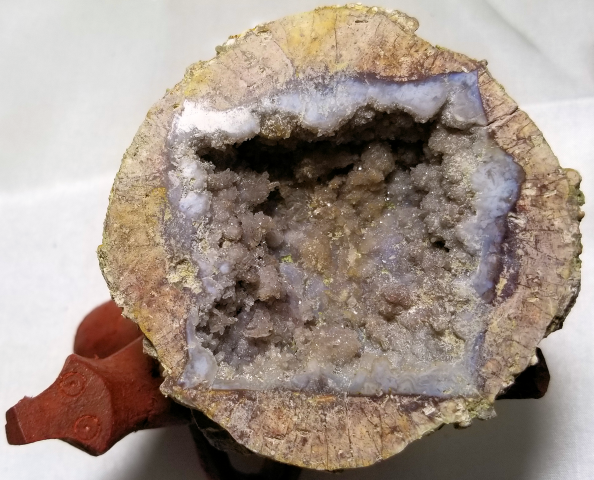 K 01 Keokuk, Iowa 3 1/2" Wide open cavity lots of qyartz crystals. 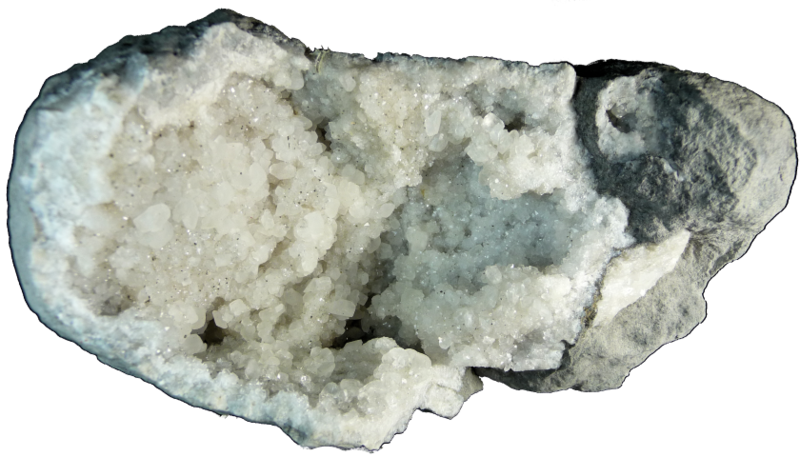 K 02 Keokuk, Iowa 4" Monster with big calcite crystals. I shouldn't be selling this one! 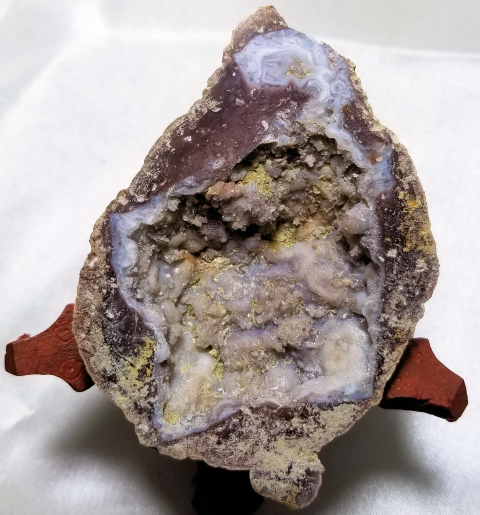 K 03 Keokuk, Iowa 1 1/2" cute little mini with calcite. 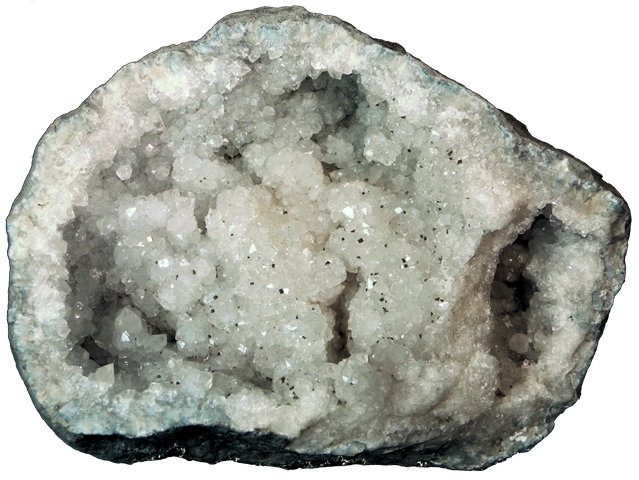 K 04 Keokuk, Iowa 1 1/4" mini perfect for a hand lens, mostly calcite crystals. 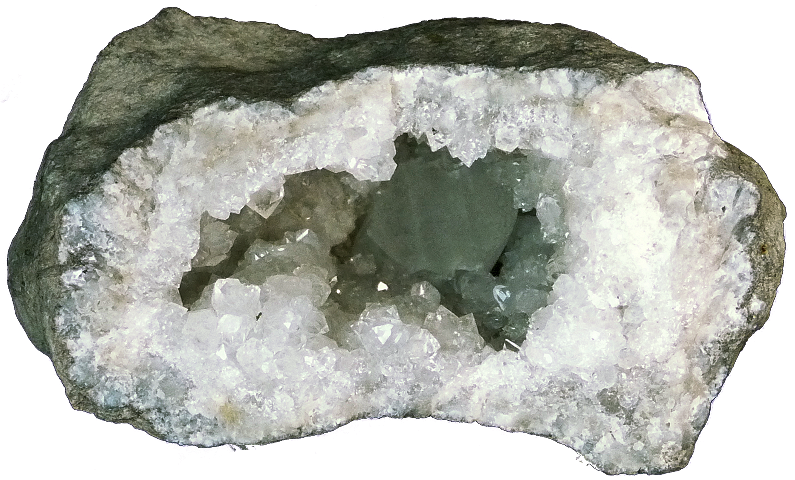 K 05 Keokuk, Iowa 3" Beefy geode with quartz & calcite crystals. 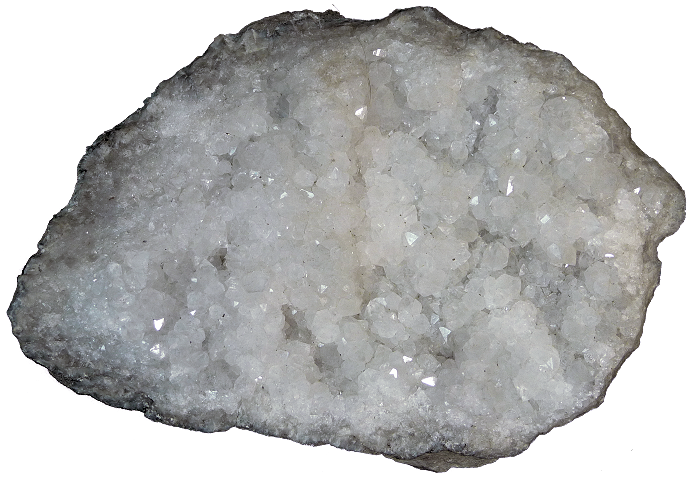 K 06 Keokuk, Iowa 2 1/2" very sparkly quartz, lightly iron stained. 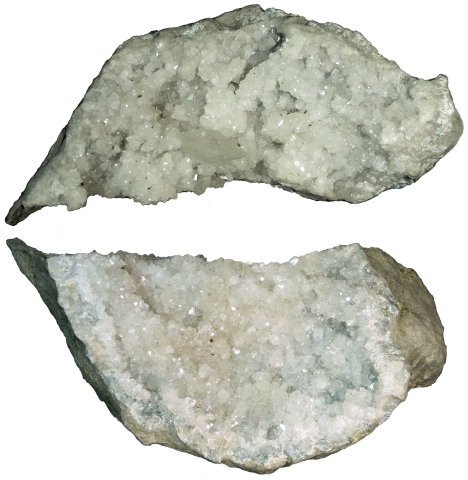 K 07 Keokuk, Iowa 3" Good sized with micro pyrite crystals. K 08 Keokuk, Iowa 2" pretty neat big calcite crystal. K 09 Keokuk, Iowa 3 1/4" wide open cavity. K 10 Keokuk, Iowa 2" perfect half. 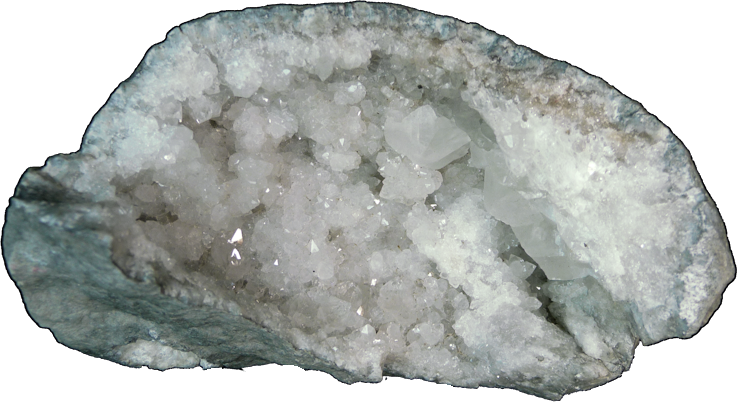 K 11 Keokuk, Iowa 3 1/2" brute, packed with quartz crystals. K 12 Keokuk, Iowa 3" front & 2 1/4" reverse. This was a wall between two cavities. Two sides for one! 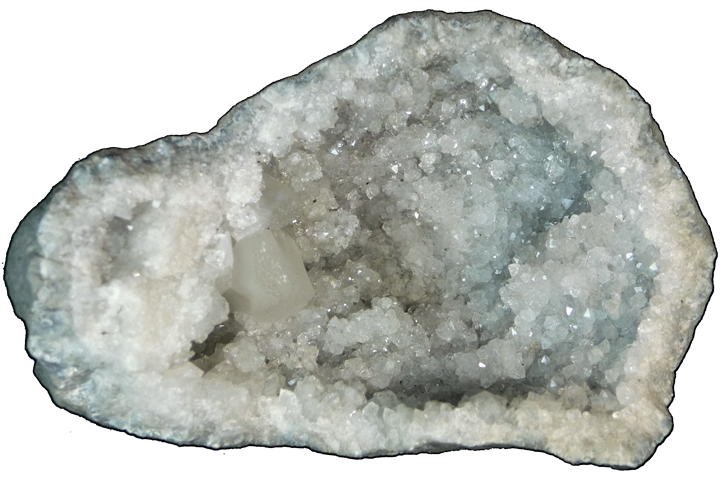 K 13 Keokuk, Iowa 3 1/4" big boy, some nice calcite crystals. 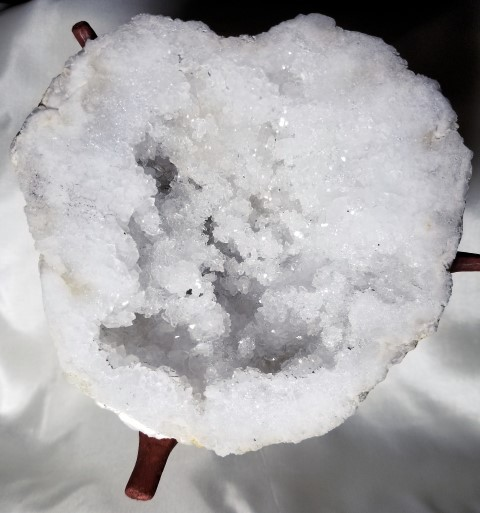 K 15 Keokuk, Iowa 1 1/4" mini with a big calcite crystal dead center. K 16 Keokuk, Iowa 1 1/2" both sides. You rarely see one that is perfectly cracked. K 17 Keokuk, Iowa 1 1/2" left & 1 1/2" right. Very cool double cavities with the caps intact. 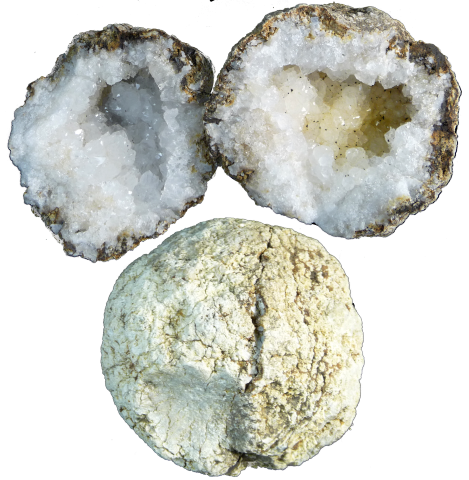 4 geodes for one! K 18 Hamilton, Illinois 2 1/2" & 2 1/4" Hamilton is across the Mississippi River from Keokuk. 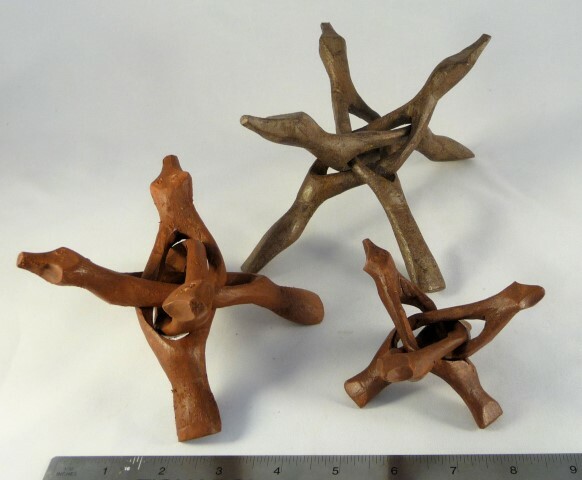 These are darker and a little different than Keokuks. 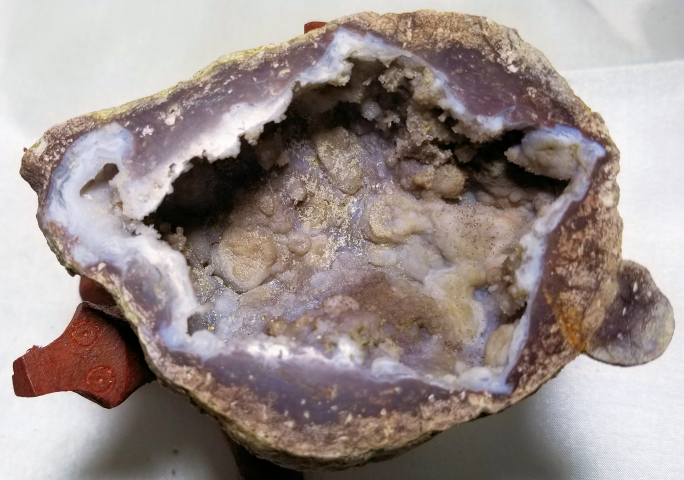 One whole geode, both halves. 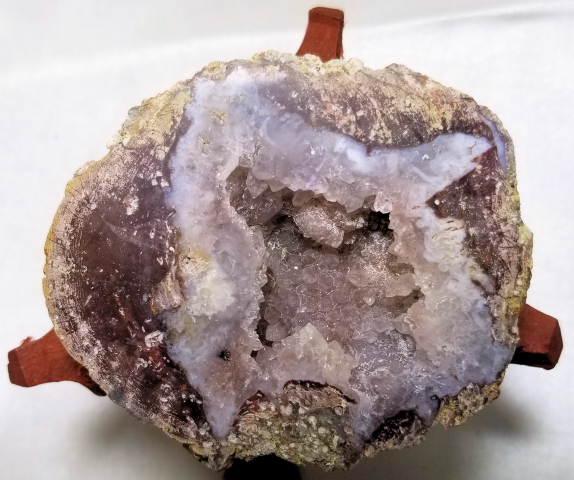 K 19 Hamilton, Illinois 1 1/2" (both) One whole geode, both halves. 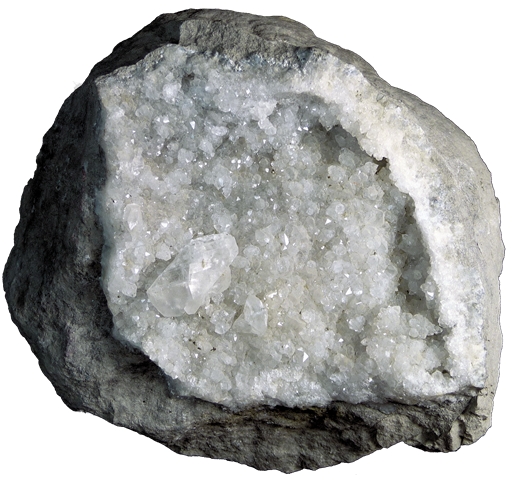 Tiny micro- pyrite crystals pepper the quartz. 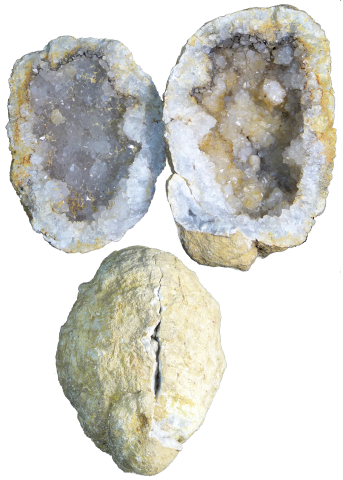 K 20 Hamilton, Illinois 2 1/4" & 2" One whole geode, both halves. Crazy "ropes" of quartz crystals.